Our Budget British Blast puts you behind the wheel of two of the country's best, low cost fun-mobiles, the classic Mini and the MGB. 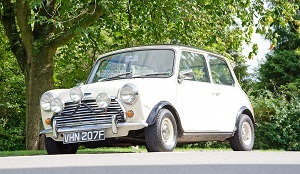 This driving experience combines the our classic Mini Cooper replica (complete with Italian Job-style driving lights) and either a MGB GT coupe or MGB convertible, depending on availability. You'll drive both cars on a 20 mile circuit of the beautiful Worcestershire countryside. The price of £59 includes fuel, insurance and passenger places in both cars. We provide the driving routes and pre-programmed satnavs too. You can book this experience online or call 01527 893733. Available dates appear below.